Bananas can be an important part of a healthy diet. They contain potassium and fiber, and are low in calories. They are typically considered a healthy food, but it is possible to eat too many. How much is too many depends on the individual’s needs for certain vitamins and minerals, but eating too many can have unpleasant side effects. What Happens When Eating Too Many Bananas? Eating more bananas than your body is able to tolerate can trigger headaches. This is because bananas contain certain amino acids that are known for causing blood vessels to dilate. This can be especially problematic if you eat bananas that are overripe. Bananas contain tryptophan, that amino acid in turkey known for making people sleepy at Thanksgiving. A banana’s carbohydrates block other amino acids from entering the brain, so there is an influx of tryptophan that leads to an increase in the production of serotonin, another sleepiness trigger. Bananas are also high in magnesium, which relaxes the muscles. Bananas contain about 7% of the daily recommended allowance for magnesium, so eating more than a dozen and a half per day will likely trigger an overdose of this mineral. These same properties that trigger sleepiness from just a single banana makes it a great bedtime snack. Bananas are a great source of potassium, but too much of a good thing can be dangerous. 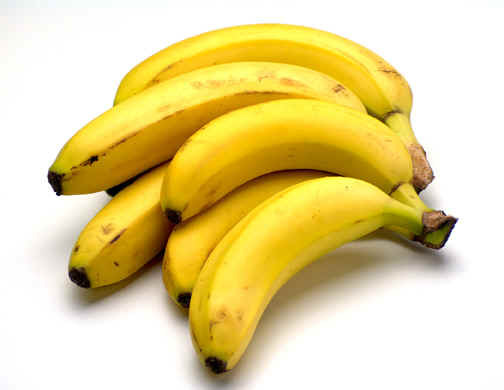 Too many bananas cause an excess of potassium, which can trigger hyperkalemia. This condition causes nausea, a slower pulse, and an irregular heartbeat. It can also trigger cardiac arrest. More than a dozen bananas in a short span of about a day can lead to too much potassium in the system. This might need to be treated with diuretics and kidney dialysis. Believe it or not, excessive bananas in a shot period of time can cause nerve damage. This is a risk for those eating a banana-only diet. Bananas contain a great deal of vitamin B6, again, something that is healthy in the right dosage. However, too much can numb the extremities and cause permanent damage in the nervous system. Keep in mind you would need to eat more than 100 bananas per day to overdose on B6, so chances are unless you are entering a banana eating contest, you are in the clear. In the rare event you feel tingling after several days of eating several bananas, you might want to skip a few days or keep your consumption to a single banana per day. Bananas are a sugary fruit, which usually is not a problem for most people. Since it is natural sugar, it does little harm, other than boosting caloric intake. However, if you overdo it, you can experience all the usual disadvantages of eating too much sugar, including tooth decay. The acid from too many bananas can eat away at your tooth enamel, damaging your dental health. Bananas contain no fat, which makes them ideal for some dieters. However, everyone needs a little bit of fat in their diet, so a practice of eating only bananas would prove detrimental to a person’s overall health. Dietary fat is essential to brain development and good health, so avoid eating only a banana for a meal. It makes a great snack or can be paired with other foods, such as peanut butter or almonds, to up the protein and fat content in the meal. In addition to containing no fat, bananas are also low in protein. They contain about one gram, so nowhere near enough to create a healthy meal. Protein helps your body build and repair tissue, and is an essential part of a healthy diet. Since bananas are high in carbohydrates, but low in protein, they are great for a pre-workout snack, but should be skipped for a post-workout refueling. The appropriate number of bananas a person should eat in one day varies from person to person. Some people can tolerate higher amounts of minerals and vitamins, while others need less. In most cases “too many” bananas is going to be far more than a normal person would ever consider eating. However, if you plan to make bananas an important part of your diet, it helps to understand just how much is too much. This is especially true because some of the vitamins and minerals in bananas accumulate in the system. Though you are not over-eating the fruit in a single day, long-term steady eating could lead to a build up of something that could become dangerous. One medium banana per day provides a single gram of protein, a little more than 100 calories, .5 grams of fat, and 27 grams of carbohydrates. Three of those grams are fiber. Bananas also contain plenty of folate, beta carotene, vitamins B6, C, and K, thiamin, niacin, riboflavin, and lutein. They are low in cholesterol and the fiber contained in bananas could help to lower bad cholesterol in the body. Most health experts recommend no more than two bananas per day. This recommendation is not only based on the risks of eating too many bananas, but also on the recommended daily intake of fruit. The average person should get about a cup and a half to two cups of fruit per day, which translates to approximately two to three servings. If you eat a banana for two of your servings of fruit, this leaves room for an additional type of fruit. However, if you enjoy eating most fruits, health experts would recommend keeping things as varied as possible. A single banana with two other varieties of fruit would be the healthiest option because it would provide the greatest number of benefits.